LEWISTON, Maine — During a speech that’s part of his ongoing effort to convince Maine voters to reject all five citizen-initiated ballot questions this year, Republican Gov. Paul LePage said Thursday that there should be a higher threshold for sending policy matters to a statewide vote. Speaking to the Lewiston-Auburn Rotary Club, LePage criticized the state’s increasing reliance on ballot questions to make major policy decisions. He said that instead of needing to collect signatures from 10 percent of voters in the last gubernatorial election, those wanting to get something on the ballot should have to collect signatures from 15 percent or 20 percent, a much tougher standard. It would be “a big, big lift to get those names” if the number was hiked, LePage said. In addition, the governor said, he’s going to seek a change in the law to require that each of the state’s 16 counties have to supply an equal percentage of signatures. An effort to require equal distribution of signatures among Maine’s two congressional districts failed in the Legislature earlier this year. LePage also said he would like to see a requirement that spending on referendum issues could not exceed the amount raised within the state. That would stop outsiders from pursuing questions on the ballot here solely because it’s a cheap place to buy advertising, he said. But the governor focused his speech mostly on opposition to this year’s ballot questions. If Mainers vote to hike the minimum wage and impose an income tax surcharge on high earners, Gov. 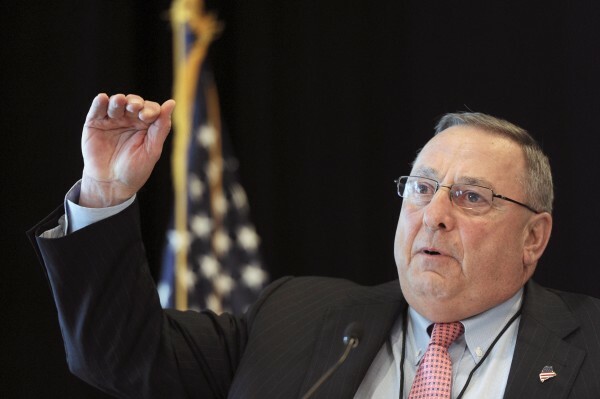 LePage fears the economy will crumble. LePage said unemployment could rise to the same levels Maine faced at the height of the recession that began in 2007. The governor said the income tax surcharge sought by Question 2 supporters would punish successful people and leave him shackled as he continues to try to pump up Maine’s economy. He said the state needs people who work hard and do well. The proposal to hike the minimum wage from $7.50 to $12 an hour is another potentially crippling revision, the governor said. In his speech to Rotarians at the Ramada Lewiston Hotel & Conference Center, he touched on many other issues. The governor said he doesn’t usually agree with President Barack Obama, but there is one viewpoint they share: “A do-nothing Congress” isn’t helping the country. “They have done nothing” for the past two years, LePage said. He said congressional leaders argue that anything they passed would just get vetoed. But instead of sitting back as a result, the governor said, the Republican-controlled Congress should be pressing ahead with good public policy even if the president refuses to sign the measures. Given the ugliness of the campaigns across the state, he said he’s making copies of a civility statement that Democrats signed when they were targeting him for some crass comments. Now he wants to remind them of that promise. Still, he noted, there’s only so much that can be done. The governor mentioned, too, that he was asked recently to name a teacher who made a difference in his life. He said he couldn’t remember one but a young nun stuck in his head. “I stayed in third grade a couple years just ’cause I liked her,” he said.